Day 6 of Obligatory Ice Level Day and while most of the other days have covered old games, it’s time to give some love to a newer classic. And hey, it has weird rainbows in it, so it fits the theme! It’s the Stranded Ship, from Shovel Knight! 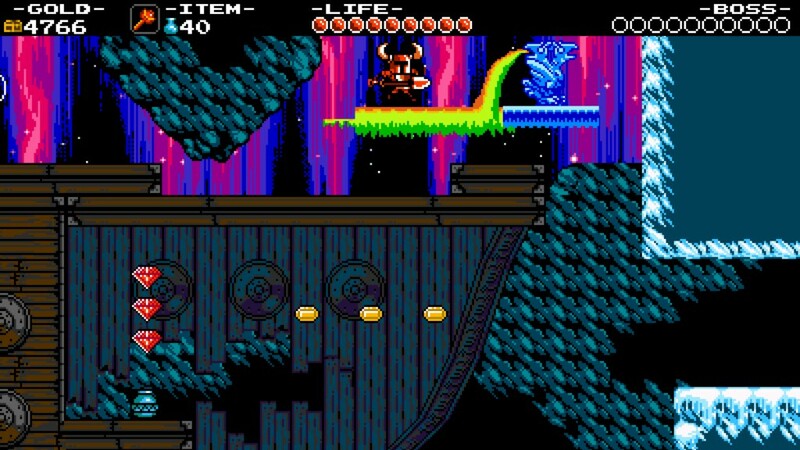 Shovel Knight, a game that puts a new spin on the old 8-bit aesthetic. This game tells the story of the titular Shovel Knight, a noble warrior with an unconventional weapon. Long ago, Shovel Knight and Shield Knight were among the most celebrated of heroes, traveling the land, doing good deeds, and finding all sorts of magical artifacts and treasures. But one night, the pair explored the infamous Tower of Fate, and in one fell swoop, Shield Knight was lost. Shovel Knight only narrowly escaped with his life, but he was never the same. Beaten, broken, and lost, he went on to spend his days mourning his lost love. Time passed, and the realm fell under the forces of The Enchantress, a powerful evil sorceress who employs a band of fierce knights known as the Order of No Quarter. The land in peril, the Tower of Fate reopens, and Shovel Knight embarks on a quest to defeat the Order and fight his way back to the tower in the hopes that he can find some trace of Shield Knight. The Stranded Ship is one of the later stages in the game, taking place in a giant glacial area. Slippery ice platforms abound, many of which can lead you directly into pits full of deadly spikes. In an interesting twist, some of those spikes can actually be rendered harmless by dumping piles of snow on them, but only if you’re careful. This level is full of enemies that really want to knock you into those pits and spikes, including Viking warriors, timber wolves, and cute little dragons that look kind of like frigatebirds. The platforming gets especially weird in this stage, since a section of it requires the use of a… two-headed rainbow-barfing bird statue…???? Simply stand next to the bird statue and attack it. Boom! It shoots forwards, puking up rainbows for you walk on! Y’know, that old chestnut! 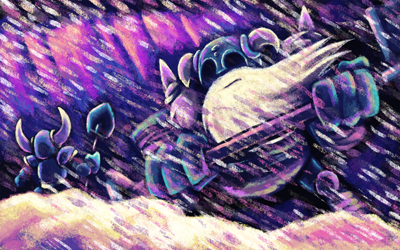 At the end of the stage, you come across Polar Knight, a member of the Order of No Quarter. This hulking brute was once a friend of Shovel Knights, but has since joined the Order out of respect for the Enchantress’ power. This battle can be tough since unlike the other knights, Polar Knight actually implements an insta-kill move by turning parts of the ground into ice spikes. He has other attacks at his disposal as well, such as running forward while shoveling snow, flinging snow into the air, jumping up and landing on you, and even pushing you away when you try to attack him. Defeating him earns you some treasure and further unlocks the way to the Tower of Fate. Shovel Knight is so ridiculously tiny. Anyway, get the full wallpaper here. So we do have some music! A Cool Reception plays during the Stranded Ship level, and The Stalwart plays during the battle against Polar Knight. And remixes! This mix of A Cool Reception is by Synthescissor, and this cover is by L-Y3T. Speaking of knights, Ice Mountain Symphony is a remix of The Ice Forest from Super Ghouls n’ Ghosts, and it’s by MkVaff. And speaking of great music, The Heavens are Calling is a remix of Beyond the White Storm from Gradius Gaiden, and it’s by Ivan Hakštok and Sixto Sounds. That wraps up it up for today’s ice level. Are you living healthy out there? You’d better take good care of yourself, if for no reason than to see what tomorrow’s stage is going to be!